Once upon a time, in the not too distant past, all long distance communication in the US was handled by one company, AT&T. There was no other company that could transmit data over medium to long distances. The breath and scope of their communications network is not understood by most people these days. Most people know that AT&T handled long distance telephone calls for the Bell Telephone System until the Bell breakup in 1984. However, AT&T did a lot more than long distance phone. For example, if you watched the network news or network TV show anytime before 1980, it was likely brought to you via AT&T microwave system, known as AT&T long lines. Listen to the news on the radio, same deal. Before the wide spread use of communication satellites and fiber optics, the AT&T microwave relay network was the only way to get various types of electronic media signals from one place to another. Beginning in the late 1980’s, competing local and long distance telephone companies began installing fiber optic cables between company offices. That coupled with the increased use of satellite systems for mass media video and audio delivery services made the huge AT&T microwave network obsolete. Some of the old microwave sites that are located in down town areas have been reused by local phone companies and cell phone providers. Many of the rural sites now sit empty. 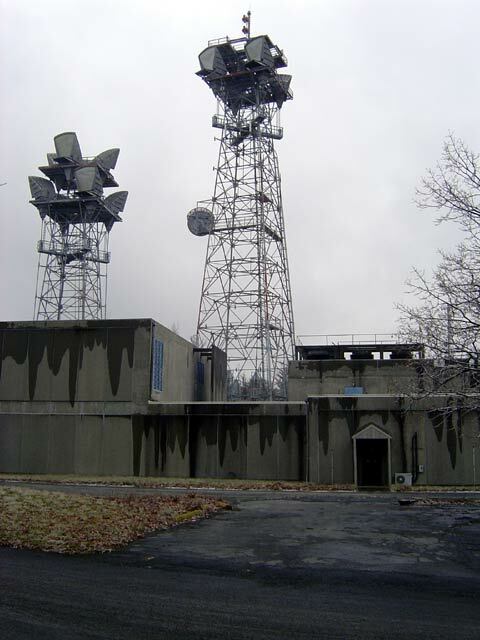 This is the former AT&T microwave relay site located near Kingston, NY. It is now owned by American Tower, Inc. There are two towers behind the building, only the tower on the right has a few active communications antennas on it. The taller tower is 190 feet tall and was built in 1957. The shorter tower is 120 feet tall and was built in 1961. Both towers and everything on them was made by Western Electric, the same company that manufactured the telephone sets. Chances are, Western Electric contracted the actual manufacture of equipment out to others, then billed AT&T, their parent company a markup. Something that would make all MBAs proud. This tower was built in 1957. The structure and galvanizing are still in excellent condition. 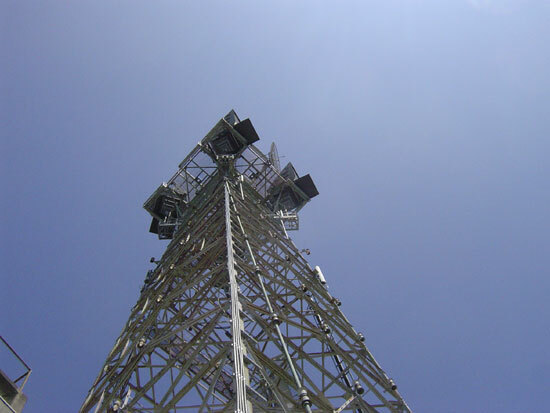 The large antennas you see on the towers are microwave horn antennas. They are no longer in use. Several transmitters and receivers would have been connected to each one of these antennas by use of RF multiplexers. Each microwave transmitter/receiver would have had several data channels. Generally, this was C Band microwave equipment, so it was in the 4, 6, and 8 gHz frequency range. All of this telephone traffic was transmitted on digital data channels un-encrypted. Many have argued that this allowed the government (most notably the NSA or National Security Agency) to intercept and listen to most domestic long distance telephone calls within the US. There is a book called Puzzle palace by James Bamford if you are interested in NSA history. It was written more than 20 years ago, so it doesn’t really apply today, but it is an interesting look at what the government was up to. 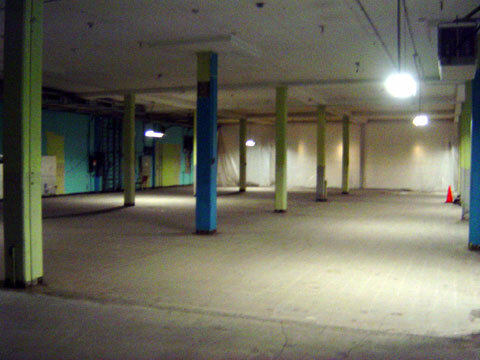 The building itself is huge, the first floor is 16,000+ square feet and the second floor is 10,000+ square feet. Only about 1000 square feet of this space is actively being used. I believe this building was built in the late 1940’s or early 1950’s, just as Kingston was growing into a major IBM manufacturing site. It has remnants of the ATT coaxial based system that was used prior to microwaves. The IBM buildings are located a few miles to the south east of this location, they are another cold war relic for discussion later. The IBM buildings were a major computer research and development site in the 1950’s until it closed in 1992. It was assumed that the Soviets had several spy satellites trying to steal secrets from the area, and the IBM facility was a primary nuclear target. The microwave relay site has 12 inch re-enforced concrete walls. The ventilation air intakes have blast baffles to prevent a pressure wave (from a nuclear explosion) from blowing the ventilation equipment off of its mounts. 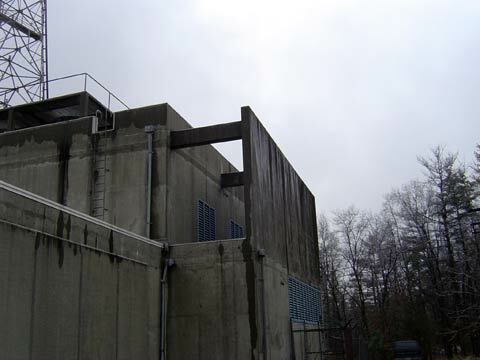 All of the outside openings were able to be sealed with steal blast deflectors using a pneumatic control panel located in the control room. There was a five minute timer, presumably to allow the HVAC units to be secured before the doors where closed. They where heavy gauge steel shutter designed to deflect the pressure wave of a nuclear explosion. Since this is an earlier building, it is likely that it is built to a 2 PSI pressure wave spec. Newer buildings were built to 20 or even 50 PSI. This microwave relay site would not have withstood a direct hit from a nuclear warhead, especially the higher yield warheads that came later on. There where three large water chillers to provide cooling to the HVAC units. Since this was the 1950’s all of the electronic equipment would have had tubes, which would have generated a lot of heat while operating. There were two loops in the HVAC system. 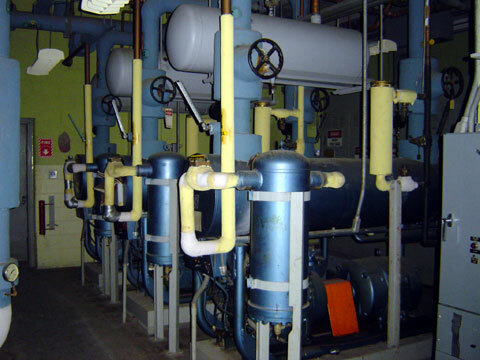 The refrigerant loop, which ran between these units and the huge condensers on the second floor roof, and the chilled water loop which ran between these units and the air handlers located in various parts of the building. There is a bomb shelter in the basement. I found a couple of olive drab cans of civil defense water laying around. 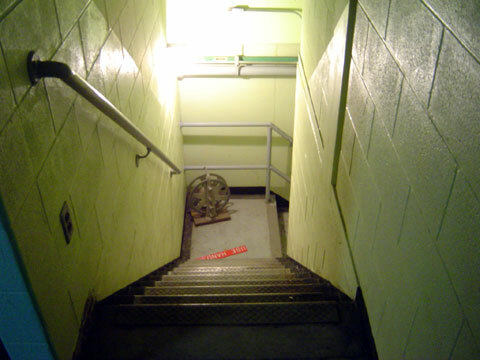 The lights were not working at the bottom of the stairs, so I chose not to go into the bomb shelter itself. There where two diesel generators, one was 325 KW which could run the entire building. The other was a 200 KW which could run the critical building functions. The fuel storage consisted of two 10,000 gallon tanks buried in the ground outside. Each steel fuel tank had a cathodic protection circuit. Basically a small negative electrical current was passed to the steel tank to keep it from rusting. Apparently it worked because when the tanks were removed in 2000 after 45 years in the ground, the primer was still on the outside of the tank. 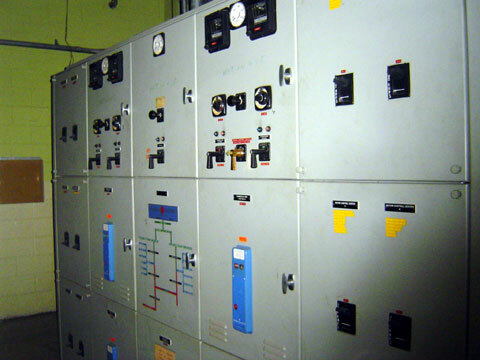 The building has it’s own power substation. The electric from the utility company comes off the pole at 13,800 volts and goes to a large step down transformer on a pad outside. 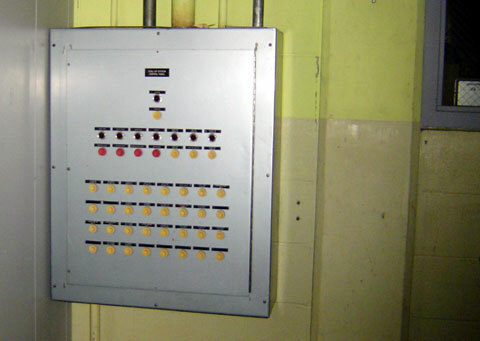 From there 480 volts is fed to this switch panel, where it is routed to motors loads or other step down transformers within the building. On the main floor, there were rows and rows of wire terminal equipment, microwave transmitters, receivers and data and RF multiplexers in racks. The room in the above picture is about 10,000 square feet, there is another 6,000 square feet beyond the plastic heat barrier. 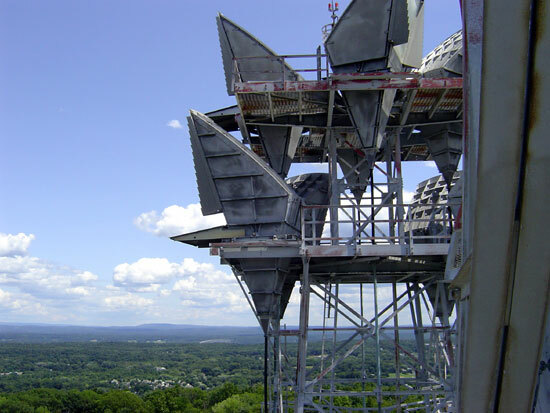 This microwave gear received and transmitted data from Albany and Germantown to the north; Poughkeepsie, Putnam Valley, Ellenville, and Spring Valley to the south. All of that equipment is gone now, replaced by empty space. Now the whole place is a little creepy. There are about 500 copper wire pairs of telephone cable that came into various parts of the building to carry the DS-1 and DS-3 circuits that interfaced with the TELCO office in Kingston. All in all, this was a serious building, no expense was spared in the construction and equipment outfitting. The entire building is shielded with copper mesh screen embedded in the concrete walls. There where redundant systems on top of redundant systems, something that you do not see these days, even in government buildings such as emergency operation centers (EOCs) and 911 call centers.